The countdown begins… baby gorilla on the way! We’re nearing the end of Kioja’s term of pregnancy, which means that our animal care team is starting to keep an extra close watch on our favourite expecting gorilla. Kioja’s due date is estimated to be in late February or early March, but like mothers of the human variety, it is possible for the baby to arrive early, or to arrive fashionably late. We’ve mentioned troop dynamics, the importance of this gorilla baby to the Species Survival Plan (SSP), and the potential outcomes for the birth of this western lowland gorilla, but we’ve have yet to talk about a question on everyone’s mind- what does the road to birth look like for a gorilla? Much like when a human is expecting a child, there are certain behaviors that are typical in a pregnancy to watch out for. In the beginning, Kioja started showing signs of morning sickness in August; she became slow to shift and did not want to eat very much in the mornings and then throughout the day. Keeper staff did notice her cramping a bit as well; she was given several types of ginger tea and offered some willow browse to ease her tummy. Soon! 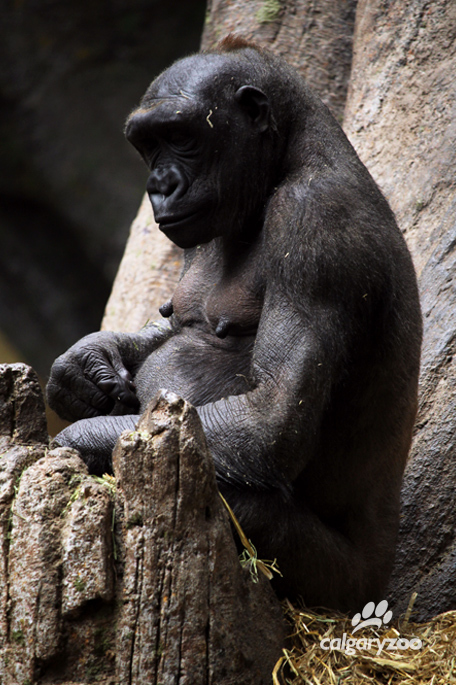 Kioja’s belly is growing steadily as she grows close to her due date in early March! Kioja continued to be quite sleepy after the morning shift for the next month; eating well early in the day, and then becoming less interested in food that was scatter-fed or offered in feeders to the family during the day. Keepers therefore fed her up in the morning with berries, smoothies and high caloric foods to get her through this period. She has been active and hungry throughout the day since. Like any growing mommy, Kioja is taking prenatal vitamins every day! Our zookeepers crush it up and put in her food, often juice or yogurt. Besides making sure her diet is full of nutrients, she is also weighed every month with the rest of the gorillas. During this time our keepers and veterinarians are able to keep a close eye on how she is progressing. Closer to the birth, Kioja will start to become restless. Just like a human mommy, she will be becoming more uncomfortable, beginning nest building activities, experiencing contractions, and soon her water will break. Here are some of the tools that our keepers use to help Kioja prepare for her baby. “Chucky” is our dummy baby that she has been taught to pick up, carry, and place on her chest. 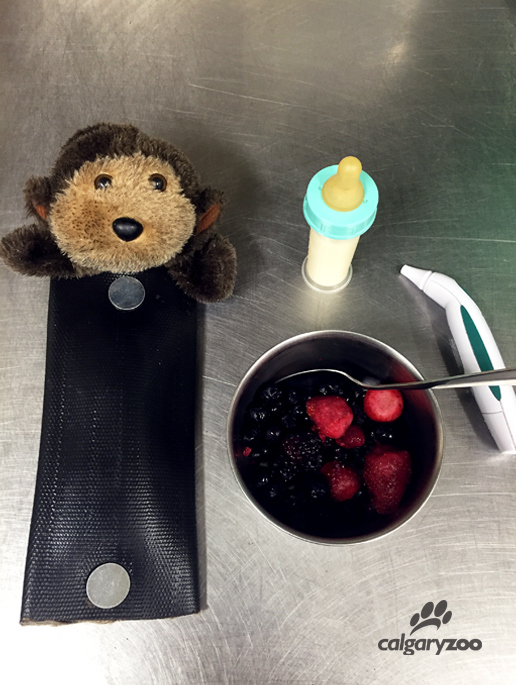 Also picture are some yummy berries, a standard bottle, and a thermometer which she is trained to use. -To sit or stand comfortably while the vets take an ultrasound and take her temperature. -To bring the baby to the animal care team. Right now, the ‘baby’ is a handmade stuffed animal. -To bring the baby to her chest for feeding; turn the baby right side up. -To bring the baby to the mesh; position the baby up at the mesh and hold while baby drinks out of the bottle. 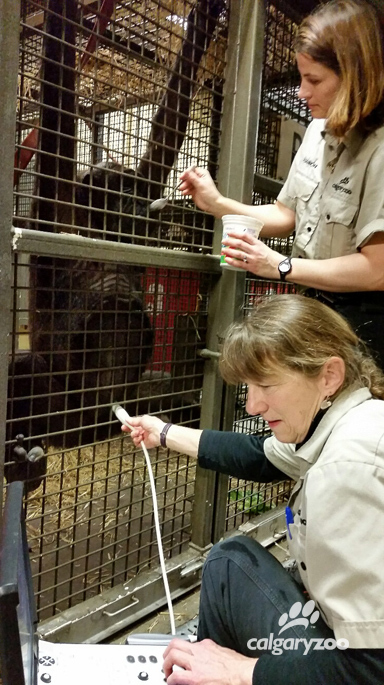 Kioja gets a treat for helping veterinarian Dr.Sandy Black gives her an ultrasound. We can’t forget the ‘nursery!’ Including the physical and mental health of the mama-to-be our staff is prepping the habitat, which includes adding new mulch and a deep bedding of straw, and setting up around the clock monitoring of the troop. The team is also conducting behavioral observations on the entire troop, looking for social tension. The restlessness that Kioja will be experiencing can translate to restless behavior in the whole troop, especially because most our gorillas have not witnessed a birth. We want baby to have a safe and happy home! As the due date gets closer the building will have more restrictions, only allowing in essentially staff. Caring for a pregnant gorilla takes a team, and they must think of everything! We can’t wait for our zoo family to meet the new addition.